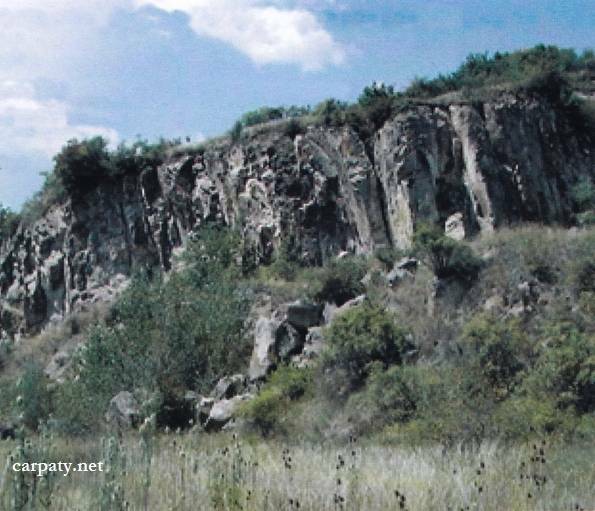 Regional Information Center "CARPATHIANS" » RHYODACITE EXTRUSION. 48° 10′ 18″N lat; 22°43′ 52″ El ong. 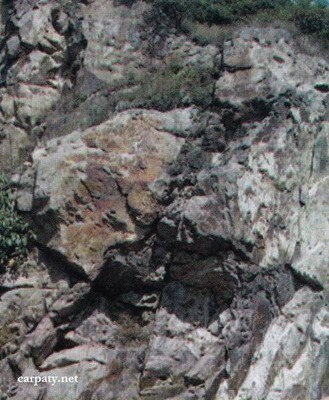 On the right bank of Borzhava River in the closed quarry up to 10 m deep and about 150 m long are discovered Middle Sarmatian phyodacites which form extrusive stock that cut Lower Sarmatian (absolute age 12.4 Ma) volcanic rocks. Cutting mode of the extrusive body is defined by geological records and confirmed by drilling. From the presently known felsic sub-volcanic bodies in Mukachivska depression described extrusion at Khaesh Mountain is youngest one. Accessible by motor-car. 300 m eastward from the turn to Borzhava village.